Aiyana Jones; aunt Krystal Jones (r) weeps as the child’s grandmother Mertilla Jones (in hoodie) speaks at rally outside Frank Murphy Hall March 8, 2013. Other family members are (in front of Mertilla, Aiyana’s mother Dominika, and (rear) Aunt Dee Dee Williams and grandfather Jimmie Stanley. At left are Aaron Petkov and Ron Scott. 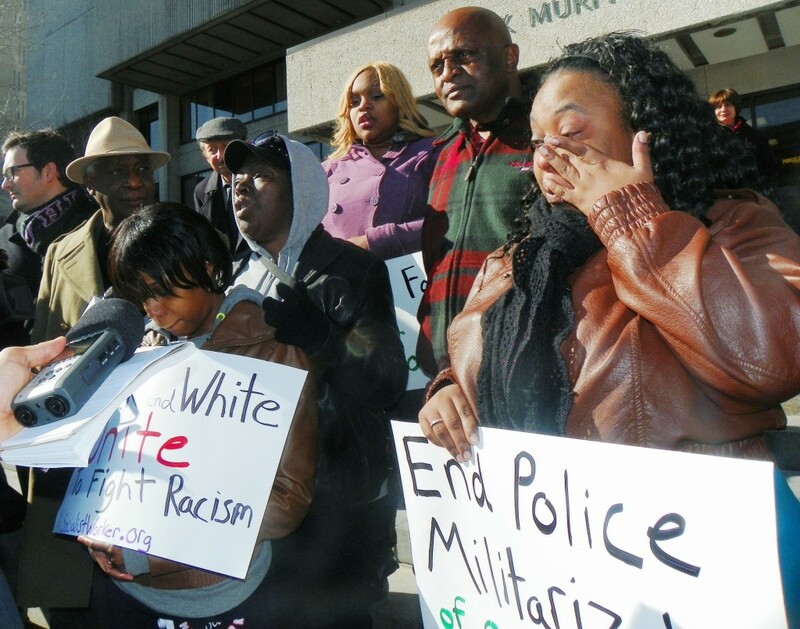 DETROIT – The family of Aiyana Jones said after a hearing March 8 that while they are glad Wayne County Circuit Court Judge Cynthia Gray Hathaway refused to dismiss charges against Detroit police officer Joseph Weekley for killing the 7-year-old child, justice has not been served. 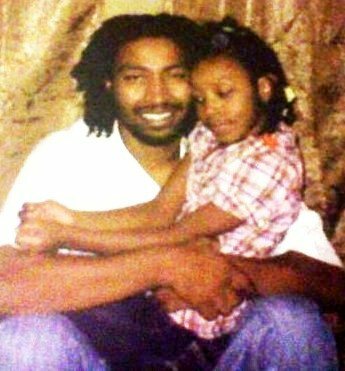 Charles Jones with his only daughter Aiyana Jones before she was killed by Detroit cop. Weekley, of Grosse Pointe, is charged with involuntary manslaughter and reckless use of a firearm in the death of the little girl. He was the lead man in a military-style raid on the little girl’s home. One cop threw a “flash-bang” grenade through the front window of the flat on Detroit’s east side shortly after midnight May 16, 2010. Seconds later, Weekley stepped inside the door and shot Aiyana in the top of the head as cameras from A & E’s “First 48” reality show rolled. The little girl was sleeping with her grandmother on the couch in front of the window. 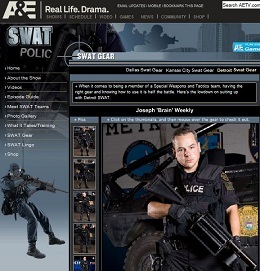 Charles Weekley as “Brain” on previous A $ E Show Detroit SWAT. Weekley, who starred as “Brain” on The First 48, was earlier involved in another case where he shot two family pets to death in front of young children during a similar invasion. 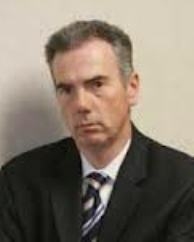 During the hearing on a defense motion to dismiss charges for lack of sufficient evidence, Judge Gray Hathaway said she said read thousands of pages of documents related to the case. She said they were not decisive for either side, and set a jury trial, which is listed with dates of both April 8 and May 29, 2013 on the court’s website. She also ruled that the jury could watch an actual demonstration of the use of a “flash-bang” grenade during trial proceedings. Weekley’s defense attorney Stephen Fishman has said that Weekley was disoriented when the grenade went off. Protesters marched in front of courthouse before press conference. Aiyana’s aunt Krystal Jones is at front. This was the Weekley’s eighth pre-trial hearing since Nov. 2011. Judge Gray Hathaway has said repeatedly in court that Weekley’s case is tied not to that of his previous co-defendant, A & E producer Allison Howard, but to that of Charles Jones, Aiyana’s father. She said she is waiting for Jones and his sister’s fiancé Chauncey Owens to be tried before Aiyana’s admitted killer goes to trial. Jailhouse snitch Jay Schlenkerman, a six-time felon and woman beater, testifes against Charles Jones at preliminary exam last year. Jones was charged with first-degree murder one and a half years after a separate incident during which JeRean Blake, 17, was killed, two days before police stormed the Jones home. Police leaked Jones’ name to the daily media within a week of Aiyana’s death, claiming he gave the gun to the shooter in the Blake case. They were evidently trying to justify the invasion of the Jones home, for which they did not have a warrant. But court records show that no one except “jail-house snitch” Jay Schlenkerman has confirmed that. Jones’ next pretrial hearing is set for April 29, 2013. Wayne County Circuit Court Judge Richard Skutt has rescheduled that hearing several times, after barring Schlenkerman’s hearsay testimony against Jones. An appeals court overturned Judge Skutt’s ruling, and the State Supreme Court has not yet decided whether they will hear Jones’ appeal of that opinion. 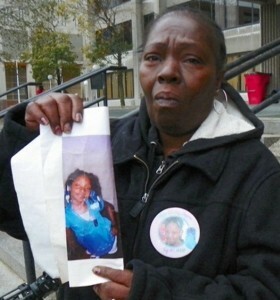 Aiyana’s grandmother Mertilla Jones weeps as she shows the child’s photo after earlier hearing Oct. 29, 2012. 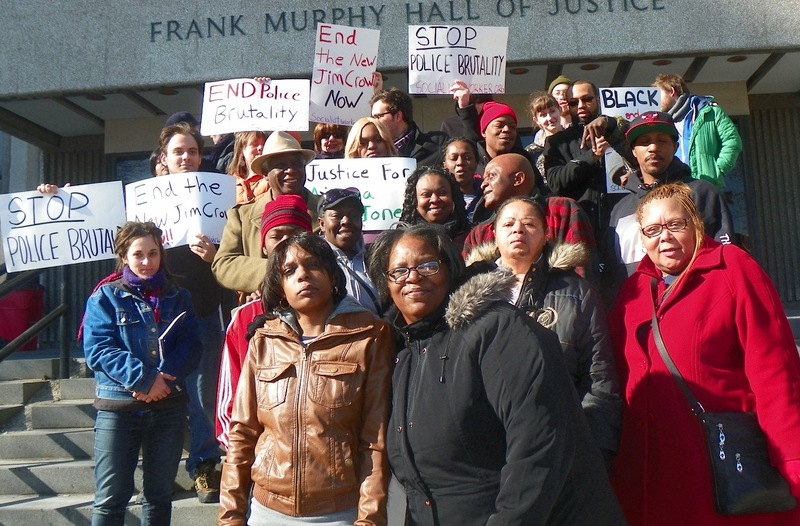 The brief hearing March 8 was disrupted outside the courtroom by cries of grief and anger from family members who were not allowed inside, including Aiyana’s aunts Krystal Jones and Dee-Dee Williams, and her grandfather Jimmie Stanley. At least eight deputy sheriffs came to the courtroom to keep them out, and later packed the freight elevator with them as they left. For the first time, many of the seats in the courtroom were occupied by uniformed police officers. There was sufficient seating for family members left outside. This reporter was threatened with expulsion after bringing that to the attention of the sheriffs. Asst. Prosecutor Robert Moran is prosecuting both Weekley and Charles Jones. 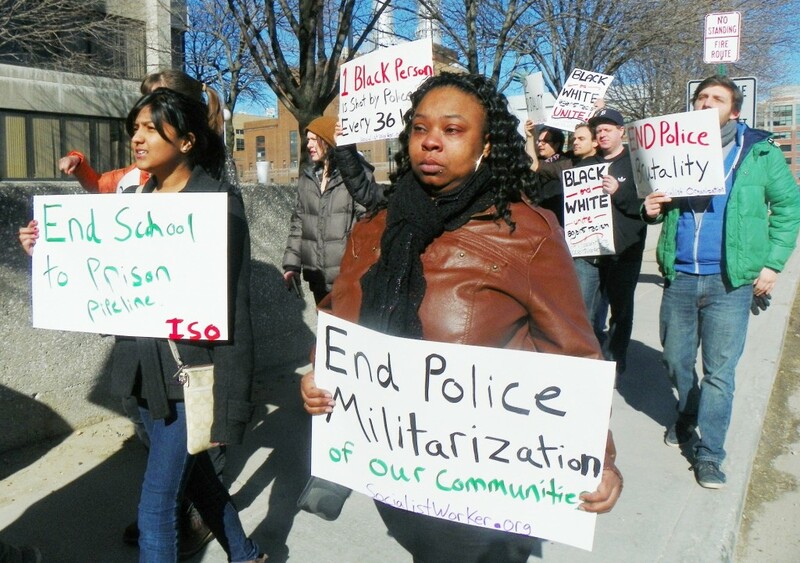 Members of the International Socialist Organization (ISO) and the Detroit Coalition Against Police Brutality, Inc. helped the family organize the turn-out. Noting that one Black person is killed by law enforcement officials every 36 hours in the U.S., according to a recent study, Aaron Petkov called for justice for the Jones family and put their extraordinary ordeal into a broader contect. He said the real criminals laying waste to Detroit and calling for an emergency manager are Wall Street banks and corporations. Ron Scott of the Coalition against Police Brutality said that not only Weekley, but the entire police team which raided the Jones home, along with those in command, should be charged with murder. The cop who ran the little girl’s body out of the house before family members could hold her in her dying moments was Kata-Ante Taylor, who shot 18-year-old Artrell Dickerson to death in an incident outside the Cantrell Funeral Home in 2007. 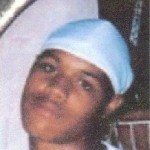 Witnesses at the scene said that Taylor shot him in the back twice, as Prosecutor Kym Worthy’s office confirmed. 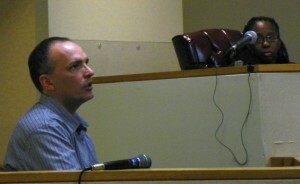 But the witnesses told this reporter that Taylor shot Dickerson in the back as he lay on the ground, already wounded.